Hello friends, again AkhmadShare.Com in this time will discuss the article on "Definition Bear [Classification and Types of Bear]", hopefully this can provide benefits to you, here's his review. 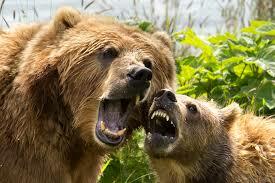 The bear is an animal mammals include carnivores in the family Ursidae. The bears have thick fur, have claws to catch, tearing and dig, and can stand on two legs. Other features of the bear, among others: have a hearing and smell are excellent and the shape of the ears round. The Asian black bear (Ursus thibetanus), also known as the bear of the month or this white chest is a kind of bear that medium-sized and often found in the more than 13,000 feet in the Himalayas. These animals are generalists or able to evolve in accordance with environmental conditions and can utilize existing resources. American black bear (Ursus americanus) is a large species of bear that came from North America. This is the smallest bear bear and are omnivores (eaters of everything). This bear live in forest areas and when they are foraging then they will not leave the forest and in lack of food so sometimes they are attracted by human activities. 3. Panda (Ailuropoda melanoleuca) Panda (Ailuropoda melanoleuca) is a mammal classified in the bear family (ursidae). This animal came from central China in mountainous regions such as Tibet and Sichuan. Pandas have black and white on his body. According to the WWF panda contains animals that are almost extinct because the birth rate is very low and the panda Habitat began to disappear. The main food of the pandas is mainly bamboo, moreover sometimes also pandas also eat meat. Polar bears (Ursus maritimus) is a large species of bear that lives in the North Pole. These bears are bears that are able to swim, they are able to swim as far as 60 miles non-stop. The polar bear has a good smell. The male bear can reach a weight of up to 800 kg and a height of 2.5 m. females while only able to reach the weight of 300 kg and a height of 2 m.
The brown bear (Ursus arctos) is a species of bear that many live in areas of East Eurasia and North America. This bear is one of the largest land predators. The bear has a weight of up to 700 kg. There are several subspecies of brown bear, brown bear, among others: Syria, Kodiak brown bear, brown bear, Alaska brown bear (Grizzly) and the brown bear Mexico. There is a brown bear populations in parts of Russia, the United States (most of Alaska), Canada, Carpathian region (especially Romania), Ukraine, Slovakia, Poland, and even the Balkans, Sweden and Finland. Honey Bear (Helarctos malayanus) is a species of small-sized between most bears 8 species of bear in the world. Many animals live in Sumatra, Borneo, China, Burma, and Indochina who live in secondary forests, old-growth forests and agricultural land. These bears in omnivores, they eat a variety of fruits and plants as well as insects, birds, small animals, and honey. It bears a lot of spending time on the ground and tree climbing bears of this type include the nocturnal or active at night. Characteristics of honey bear among other things: the length of its body on its back, the height of 1.40 m 70 cm with a weight range from 50 – 65 kg. , Her eyes brown or blue, other than that his nose is relatively wide but not too the muzzle. Most types of fur is short and smooth in comparison to other bear, a dark black or brownish-black fur under its neck, there is a unique orange-colored sign that is believed to depict a Sunrise so usually called sun bear. Spectacled bears/Bears (Tremarctos ornatus) eyeglasses are also called Andean Bears the bear is endemic to South America, such as Colombia, Venezuela, Bolivia, Peru, to the Aquador. This animal called a bear circle eyeglasses because its head at the eyes that look they're using glasses. The bear is included in a nocturnal animal. Sloth Bear (Melursus ursinus) is a species of bears are nocturnal and include insectivora. The spread of these bears a lot in the warm equatorial forest regions such as South Asia to Southeast Asia. Bear it in dangerous animals in the world.